Recently, the term “workflow” has become a bit of a buzzword in the business community. And while most business owners can intellectually understand why workflow is important, it’s hard to truly wrap your brain around it until you have actually seen it in action. Workflows can help streamline and automate repeatable business tasks, minimizing room for errors and increasing overall efficiency. This, in turn, dramatically improves your business. Managers can make quicker, smarter decisions and employees are empowered to collaborate in a more productive and agile way. However, developing a workflow in your business is no small feat. It can often be incredibly challenging, as it requires that you can see the big picture while simultaneously paying attention to the hundreds of small details that go into it. But as a business owner, you must develop strategies for how you can help your business grow and stand out in a competitive marketplace. Workflow automation is just that — a strategy to help you improve the efficiency, overall revenue, and day-to-day operations of your business. Mapping out your processes in a workflow allows you to get a more clear, top-level view of your business. Even if you have a well-established set of business processes, do you really know if they are delivering you results? Are the processes as good as they could be? One of the biggest reasons why workflow is important is because it gives you greater insight into your processes. From then on, you can use the said insights to better your workflows, and improve the bottom-line of your business: get more profits. Want to learn how to create process map? 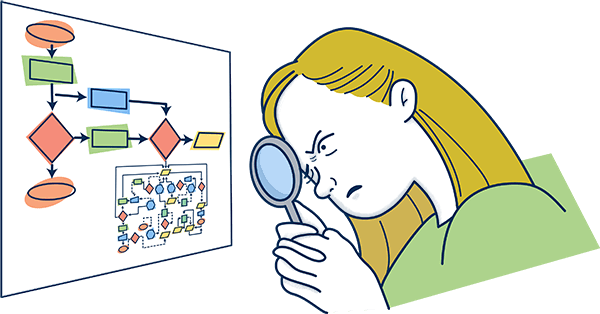 Check out our step-by-step guide to business process mapping. In many businesses, there are tons of unnecessary and redundant tasks that take place daily. Once you have more insight into your processes, you can determine what activities are truly necessary. Identifying and eliminating redundant tasks has, of course, countless benefits – it creates value for your business. Instead of wasting time on a useless task, your employees will be able to focus on what’s important, and what does contribute to the business. As such, the more useless processes are eliminated, the better your business will perform. Micromanagement can cause a lot of problems in a business setting: employees hate being micromanaged and (most) managers hate having to do it. Studies have shown that micromanagement is often cited as the biggest reasons for quitting a job. In some cases, however, there might just not be any other solution but micromanagement. There’s important work to be done, and not everyone is as motivated to do it. By clearly mapping out your workflow, everyone knows what tasks must be completed, who will be completing them, and when they need to be finished by. When the workflow process is clearly laid out in this way, managers can spend less time micromanaging their employees. There’s no questioning on what the further steps are, or if there something wrong with “step 4.” Everyone in the team sees exactly what’s going on, and what needs to be done. This will, in turn, increase the job satisfaction of everyone involved and will most likely improve the relationships between management and employees. To really get the most out of your workflows, you need to use the right software. Workflow Management Software is a centralized hub to track, analyze, and improve your workflows. Want to learn more? Check out our guide to workflow software. Have you ever felt like your workplace is like a game of telephone? Everyone is talking but somewhere along the way, the message becomes muddled. Poor communication is a common workplace problem that is often not dealt with. According to this article in the Harvard Business Review, communication in the workplace is critical because it affects every other aspect of the company. There are cases where the main conflict in the organization is from miscommunication – employees and management supposedly “disagreeing,” even if both are after the same goals. Which leads us to another big reason why workflow is important: visibility of processes and accountability can increase workplace communication dramatically. This communication will reduce employee turnover and make day-to-day operations smoother overall. Without your customers, there is no business to run. So, it is important to constantly find ways to improve the customer experience. Unfortunately, customer requests or complaints can be easily overlooked when you are relying on outdated manual systems. This results in dissatisfied customers who will end up taking their business elsewhere. Workflow can, however, help you provide better customer service and respond to customer complaints more quickly. Often, employees are chosen for projects based on who is available rather than who has the best skill sets to perform that job. Another reason why workflow is important is that it allows you to think about and choose the individuals who are best suited to perform the available tasks. By automating workflows and processes, you can also reduce the likelihood of human error. Over time, this will improve the quality of your products or services. Although many business owners understand why workflow is important, it often takes a backseat to more immediate and pressing business operations. This can happen because most business owners feel that they are operating well enough without a clearly defined workflow. If you’re an SMB owner, however, setting up and optimizing your workflows might just be what sets you apart from your competition. Do you have any experience with setting up and optimizing workflows? Let us know how it helped your business down in the comments! Policy Management: What Is It and Why Is It Important?